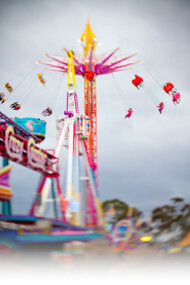 Smart Amusements has grown over the the last 35 years from a hire bank of one fairy floss machine to Melbourne’s most comprehensive range of amusement rides, food equipment and games for hire. Whether you are holding a fete, festival or company picnic our staff will be able to advise you on the right combination of fete equipment to entertain your guests. You can come into our premises to pick up smaller items or have these operated alongside with rides by our courteous uniformed staff. Our mission is to provide clients with modern, well maintained equipment to make your event a safe and happy experience. All rides are covered by Public Liability Insurance and are regularly checked by a qualified engineer. We also manufacture fairy floss machines. Call or email us to find out how best we can help you with your event or entertain your guests. Do not hesitate to ask for assistance in obtaining any item not listed on this website.